Tasty, easy, and impressive! Serve with couscous or rice. Place chicken in the bottom of a slow cooker. 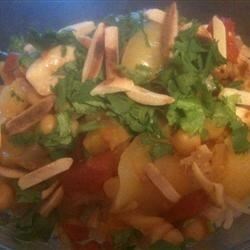 Add the garlic, onion, tomatoes, peaches, garbanzo beans, dried apricots, cumin, ginger, cinnamon, coriander, and cayenne pepper. Pour in the chicken broth. Cook on Low for 5 hours. Remove the chicken and keep warm. Mix the cornstarch and water in a small bowl. Stir the cornstarch mixture into the slow cooker. Cook on High until the sauce has thickened, about 15 minutes. Return the chicken to the slow cooker and heat through. 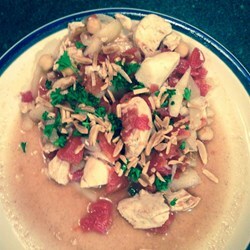 Top with fresh cilantro and almonds before serving.